Chiang Mai Pool League: Congratulations! 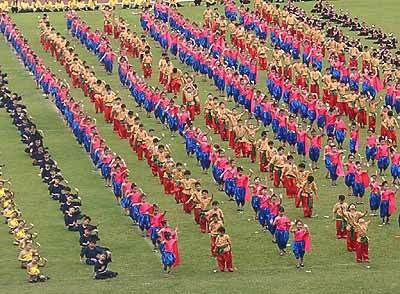 “Tai Rom Pho Thong” show performed by 1,457 students of 37 private kindergarten schools. (Photo Pinutda Suwanchaisri). The Private Education Board Office designated February 10 to be the Private Education Day of Thailand, to publicize the importance of the role of private schools in the country’s education system. Private Education Day is also held to honor the high standards and dedication of the teachers and staff of private schools and to highlight their importance as educators. To emphasize this, the Chiang Mai Private School Club joined with 109 kindergarten schools throughout Chiang Mai to organize a Private Kindergarten Sport Competition on February 10, 2006 at Chiang Mai 700 Year Anniversary Stadium. Activities were held this year to celebrate the 60th anniversary of HM the King ascending the throne with around 5000 teachers and students in attendance. There were parades of pupils of private schools, a presentation ceremony awarding Royal Thai Orders and Decorations to teachers, and sports competitions between the 109 private kindergarten schools. Dr. Peerapun Palusook, assistant of Minister of Education presided over the opening ceremony and Kanong Tonlek, president of Chiang Mai Private School Club gave the details of the sports competition. “Speed Badminton” was invented in Germany and is currently being played in Germany, Switzerland, United States of America, Japan, Korea and Thailand. 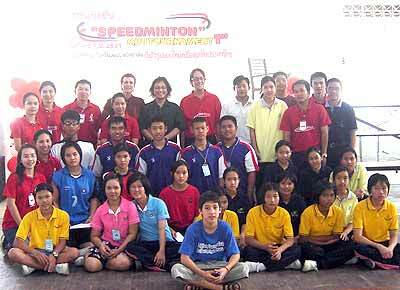 Cizen Thailand sponsors “The Speed Badminton Club”, which provides free equipment, coaches, clinics and tournaments to 16 Chiangmai schools which participate in their program. Next month they will expand the program to 20 schools in Bangkok. including Bann Viengping orphan school. Prizes worth a total of 28,000 Baht were awarded, with the students winning free sports equipment valued at 15,200 baht for their schools. organizers will be used as a model for all countries to follow. Participants at the International Convention represented Germany, Switzerland, United States of America, Japan, Korea and Thailand. Thailand should be proud of this international recognition. “Speed Badminton Club” is now organizing an adult division for the next tournament to be held May 5-7. We invite everyone to join “The Speed Badminton Clinic” at the Yupparaj Wittayalai, Saturday and Sunday, 9 a.m. till 12 noon. Coaches and equipment will be available for use. These weekly clinics are free. For more information, please contact “Speed Badminton Club” at 7-15 Bann Thapae Building, Thapae Road, Chang-klan, Muang, Chiang Mai 50100. Tel. (053)275-583, (053)272-135 Fax. (053)275-628. Promotion girl with a Ford motorcar at the Northern Motor Expo in Chiang Mai. The Federation of Thai Industries, North Region and the Federation of Thai Industries Chiang Mai Provincial Chapter with Intermedia Consultant company promoted the first ‘Northern Motor Expo’ running from February 9-19, at Chiang Mai 700 Year Anniversary Stadium. Organizers claim there were almost 200,000 visitors spending a total of around 2,000 million baht. The aim of the Northern Motor Expo 2006 is to boost the car market in this region and to offer residents in the north the opportunity to experience the new technology in motorcars from different brands. The vehicles were displayed in a 30,000 square meter exhibition area. Last year, Thailand exported vehicles valued at almost 400,000 million baht and the high standard of vehicle production in Thailand is recognized internationally to be as good as anywhere in the world. Major motor companies from Japan, America and Europe have manufacturing or assembly bases in Thailand. The motor expo presents a good opportunity for northern citizens to see the new models, as well as seeing the range of products from auto suppliers and car audio outlets. Test-drives could also be arranged for interested potential buyers. It is planned to have the Motor Expo every two years. Adventure racing is a new and very fast growing sport that integrates physical and mental endurance, teamwork, the great outdoors and adventure. The race is a non-stop expedition during which teams of two competitors must complete a course from checkpoint to checkpoint as a group. Teams travel by methods such as mountain biking, trail running, canoeing, rafting, rappelling and other novel ways. Teamwork, determination, perseverance, strategy, endurance and toughness are the main principles guiding teams trough the woods, rivers, lakes, and mountains in the course of a typical adventure. The river Kwai Trophy 2006 combines a challenging one day race in the magnificent beauty of the river Kwai valley. Start and finish in the vicinity of the Pung Waan Resort, on the banks of the river Kwai. The resort has been booked entirely for the Race. It is also possible to rent good bikes here (booking in advance please). ing, running, river swim and kayaking. The race route travels along scenic trails and explores the mountains and farmlands of western Thailand. By phone: 0 2286 5129 (Khun Nid or Khun Sassi) or 0 1922 7100 (Serge). Top two teams join together. 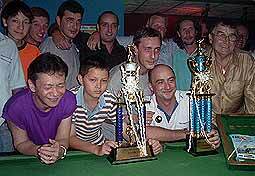 As tradition dictates, the title presentation for the Chiang Mai Pool League is hosted by the new Champion’s, and a very good crowd of players, managers and their supporters turned out at Half Moon Pub last Friday to see Steve raise the winner’s trophy. The Half Moon Pub team has been the model of consistency this season. They topped the league after just three matches and stayed there till the end. Their only serious hiccup came in early December when they lost back to back encounters against Chiangers and Bangers and Friend’s Corner, but they rebounded forcibly in the next match with an 8-1 win over La Villa. So, as Steve took the trophy from pool enthusiast David Hardcastle of Good Morning Chiang Mai News, no one can deny that he and his side are worthy champions for the second time in the last three seasons. Congratulations are also in order for skipper Mark and Blue Sky Bar, who picked up the runners-up prize. In 7th place at the start of this term, it took them six matches to reach second spot. From then on their form fluctuated – often slipping to third and once fourth behind Half Moon Pub, Chiangers and Bangers and The Wall. But they peaked at just the right time. Chiangers and Bangers had held second position for seven consecutive weeks, but with a gutsy performance, Blue Sky Bar beat Chiangers 5-4 in the penultimate game of the season, and the rest is history. Without a bottom there can’t be a top, and much credit goes to the teams that ended their fixtures losing far more matches than they won. There are many good players performing for sides in the lower half of the table and they should not be underestimated next time out. It took bottom team Happy Bar 15 matches to notch their first win of the season and they only won two more after that. But with a little more luck in their 4-5 losses, they could have finished in the top ten. level of sportsmanship, and these very enjoyable last few months would not have been possible without John Whiting of True Blue and Out Back. John started the league four years ago with Darren of Home to Roost, but he has been a one man show for some time now. He’s the guy who tells us where we’re playing, what happened and current standings by issuing and dis-tributing weekly information sheets. Every Friday night of the season he referees seven matches at the same time – confirming rules and settling disputes – by either mobile phone or whizzing round the venues in person. A large number of people have mentioned their appreciation of John’s efforts and so many thanks go to him for arranging last season and the next, which we are all very much looking forward to.